Macklin: 35 wins and six defeats since turning pro in 2001. MATTHEW MACKLIN HAS announced his retirement from boxing two days short of his 34th birthday. “The Tipp Tornado” retires with a professional record of 35-6, signing off on his career following a majority decision win against Brian Rose last month. That victory in London’s O2 Arena was Macklin’s fourth straight win as he attempted to launch himself towards one last world title bid. But speaking to Sky Sports News this morning, the Birmingham-born fighter confirmed that he is hanging up his gloves. An Irish, British and European champion, Macklin fought three times for the world middleweight title but lost to Felix Sturm, Sergio Martinez, and Gennady ‘GGG’ Golovkin. That defeat against Sturm in June 2011 is still widely remembered as a night when Macklin fell foul of some dubious hometown judging, with Sturm retaining his WBA strap via a contentious split decision in Cologne. Often linked with Irish ‘superfights’ against his middleweight rivals John Duddy and Andy Lee which never materialised, Macklin will be best remembered for an enthralling British title fight against Jamie Moore in 2006 where he suffered only the second defeat of his career. Email “3-time world title challenger Matthew Macklin retires from boxing”. 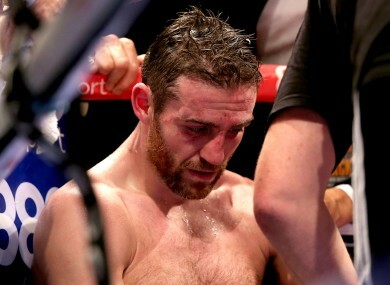 Feedback on “3-time world title challenger Matthew Macklin retires from boxing”.